Tofu and Tomato Pasta Sauce is a liquid gravy that adds flavor to any dry snack. 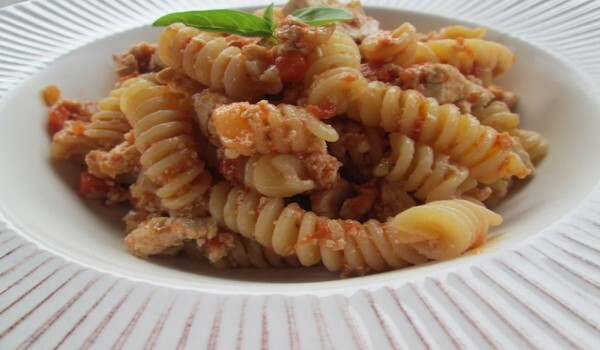 Learn how to make/prepare Tofu & Tomato Pasta Sauce by following this easy recipe. Take a saucepan and heat oil in it. Add crushed garlic and onion. After 2 minutes, add green pepper and cook for 5 minutes. Add crumbled tofu to the mixture. Cook for 5 minutes, stirring occasionally. Allow the liquid to boil away. Add tomato puree, sugar, salt, basil, marjoram, hot chilly sauce and spaghetti. Sauté the ingredients and cook for 15 minutes. Garnish with parsley, when it's ready to eat.